We are a notable Exporter and Supplier of vast gamut of Stainless Steel Shelf. We are engaged in making available diverse range of Stainless Steel Shelf that is suitable for every establishment. 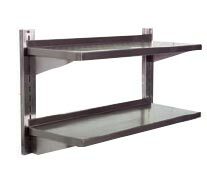 The Stainless Steel Shelf is made from high quality stainless steel AISI 304 (18/10). Multi choices in Stainless Steel Shelf help you to utilize all the available spaces for storage.